I wish I could enjoy April in Paris or New York, but alas, I'll have to take Collingswood and Philadelphia for my spring-time reveries. The colours, smells and foods of spring are all uplifting. And it makes me want to eat lighter and brighter foods. Asparagus. Baby New Potatoes. Lamb chops. Strawberries and rhubarb desserts. For a timely spring recipe I concocted a newer version of some low-fat, creamy style recipes that I've been reworking. 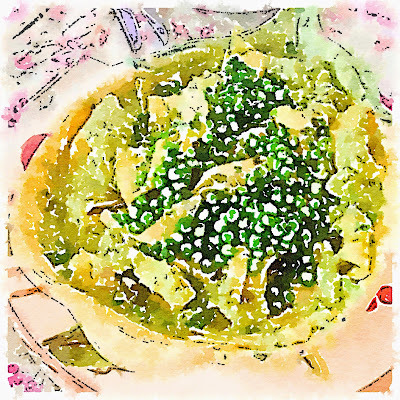 My usual standby Spring recipe is the Asparagus and Lemon Puree that I adore - 5 ingredients, practically non-fat, and fabulous enough to make as an impressive diner party fare. 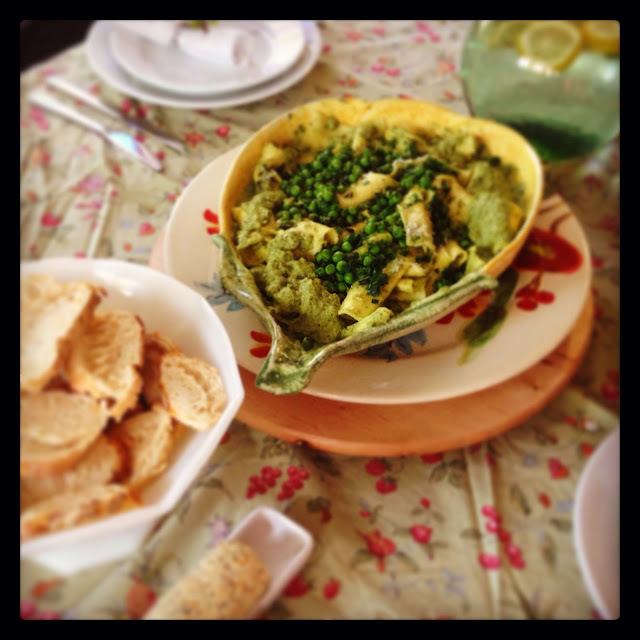 At our Easter Dinner a few weeks ago, I was in the mood for peas, mint and shallots. But that sounded a bit bland, or hard to work into a pasta dish without having a sauce for it. I wanted the sauce to be creamy but not too rich. Satisfying yet healthy. A puree of freshly cooked peas, sauteed shallots, mint, basil and parsley did the trick, folded into non-fat ricotta with a touch of lemon and zest for a bright clean flavor. Originally I had planned on making ravioli but then I didn't want to do all that work, even if I did use ready-made noodles. Hmm, what to do what to do? I made "deconstructed" ravioli instead. Which is a funny foodie way of saying that I made the filling and served it over wide ravioli shaped pasta. It worked. I took fresh store bought lasagna sheets and tore each sheet into six pieces with rough torn edges. The result was a festive riot of spring tastes. While the pasta water is boiling, heat the olive oil in a non-stick saute pan over medium heat until the oil begins to shimmer. Add in the minced shallots and saute until the shallots turn translucent, about 4 minutes. Reduce heat to low and add in the blanched peas, mint, basil and parsley and saute for 2 minutes, then remove from heat. Season the onion mixture lightly with a pinch of salt and a few dashes of freshly ground black pepper. Set aside to cool. When the mixture is cool enough to handle, puree half to 3/4 of the peas (reserve the rest of the peas for garnishment) in a food processor or blender with a bit of the pasta cooking water. Puree the mixture until it is relatively smooth. 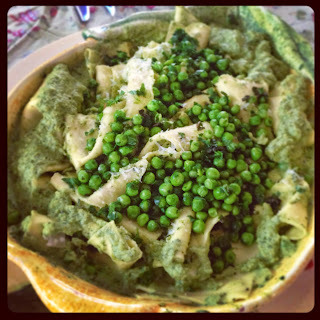 In a large bowl, add the pea puree to the 2 cups of ricotta, along with the lemon juice and lemon zest. Fold to incorporate. Taste and adjust seasonings. Set the mixture aside. Meanwhile, cook pasta until it is al dente. Before draining, reserve 1 cup of the pasta cooking water. Pour the pureed pea and ricotta mixture over the pasta, and fold to incorporate. If the sauce is too thick, thin it with some of the reserved pasta cooking water. Either plate the pasta onto individual serving bowls/plates, or put it into a large pasta serving platter. Top it with the reserved sauteed peas/shallots/herb medley and garnish with the additional sprigs of mint, basil and parsley leaves. As a splurge and for added flavor, top with a good quality freshly grated cheese such as Parmesan, Pecorino Romano or Locatelli. Serves 6-8 as a side, or 4-6 as a main course.